Almost every field of human discovery has gained immensely from the invention of computers, astrophysics maybe more than most others. Experiments are not an option in astrophysics. We cannot form planets, stars, or galaxies in laboratories on earth, but only observe them in an uncontrolled fashion using telescopes. We therefore rely on mathematical models that predict observations which we can test in reality. As the range of analytically tractable problems is very limited we rely on computers to numerically help us to understand the cosmos. In this talk I will concentrate on a specific branch of astrophysics and cosmology, the science of the evolution of the Universe as a whole: simulations of cosmological structure formation. 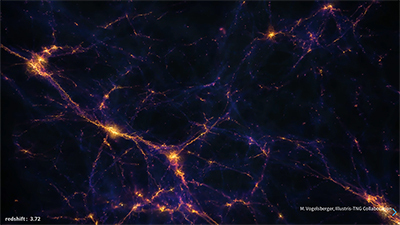 These simulations follow dark matter in an expanding universe as it collapses under the influence of gravity into the structures which are the birthplaces of galaxies. We will see how these galaxies are glowing tracers on the highly complex, almost invisible structure of the cosmic web. The largest of these simulations are immense computational undertakings and take tens of millions of core-hours to run on tens of thousand of cores while producing hundreds of tera- if not petabytes of output. Throughout their history they have pushed to the limits of technical feasibility and limits of computing power. They are so rich in information that teams of scientists can find new results in them years, sometimes even more than a decade, after they were run. After a quick overview of our current understanding of the development of the Universe I will give an introduction to simulations of the dynamics of dark matter with so-called N-body simulations and how these were developed in the 20th century. We will then explore how people follow the evolution of gas and galaxies in these simulations to fill the darkness with stars, supernovae, black holes and sometimes even light. Finally, I will show how these simulations are comparing against our observations and how they helped us to further our understanding of what the Universe is made of, before ending with a short outlook on how cosmological simulations might improve in the future to explain more phenomena and keep up with observations. Philipp Busch born in 1991 in Berlin I studied physics at the Free University of Berlin. In 2015 I completed my master’s thesis at the Leibniz-Institut für Astrophysik (AIP) in Potsdam looking at the shapes and concentrations of simulated dark matter haloes. The same year I started my PhD on the morphology of large scale structure and the reionisation process at the Max-Planck-Institut für Astrophysik (MPA) in Garching, close to Munich. My research interests lie in the field of galaxy formation and the large scale structure of the universe. Here I am mostly interested how these two domains interact. 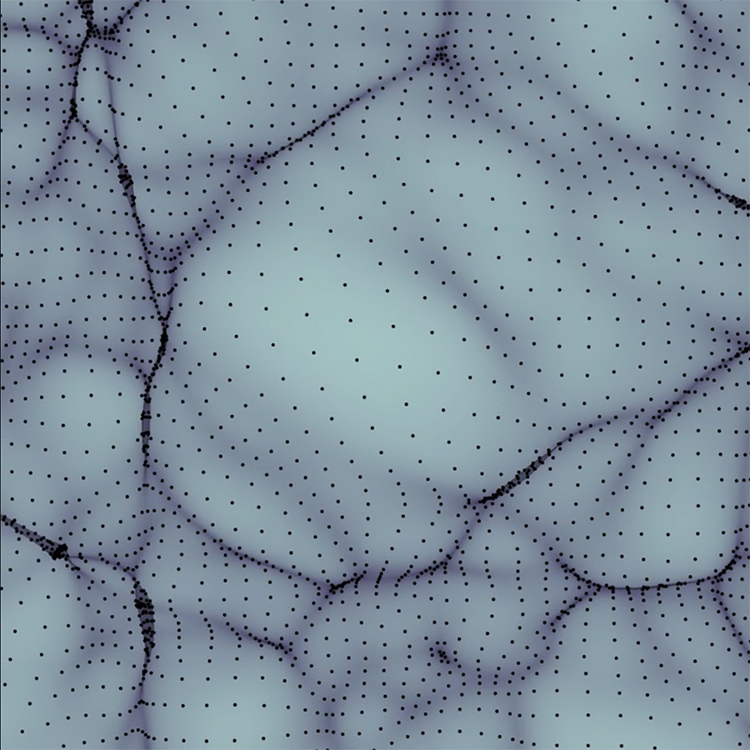 For this I use methods of computational geometry to describe the morphology of large scale structure in a qualitative and quantitative way. I then want to find out how galaxies differ in regions of varying morphology. I also investigate how galaxy properties imprint on the morphology of the reionisation process in which the light from the first galaxies transparentised the universe by ionising hydrogen atoms.